The geniuses at Burger King have found a new part of the chicken. They are behind the fingers and above the (dinosaur shaped) nuggets. They are the fries of the chicken. And since chicken nuggets are for children and whole meat chicken tenders are too expensive to produce, Burger King has taken these ChickenFries™ and coated them in buffalo flavored powder so that grown men can eat them and still feel like a man. They are the perfect companion to watching sporting events alone. Drive through the drive thru then don't forget to drive through a carry-out to pick up thirty of their cheapest lite beers. Even though you probably got a Coca-Cola with your large combo meal, you're going to need beer to recreate the sports-bar atmosphere in your one bedroom apartment tonight. I saw a commercial for these Buffalo ChickenFries™ a while back and immediately knew that sooner or later our stars would cross, fates intertwined, arriving at the one and only pure truth in an infinite embrace of destiny. Burger King is classically disgusting unappetizing. I've never been shy about ranking it at the bottom of fast food along with the likes of Subway. Although, if you remember back in October I accidentally ate a Whopper and was surprised by how not-terrible it tasted. I could never bring myself to go back to get the black bun Whopper (#sorrynotsorry). Yet only a quarter of a year later, here I am back at the trough of the BKLounge. I've exceeded my BK quota by 200% and disappointed everyone I've ever known myself. 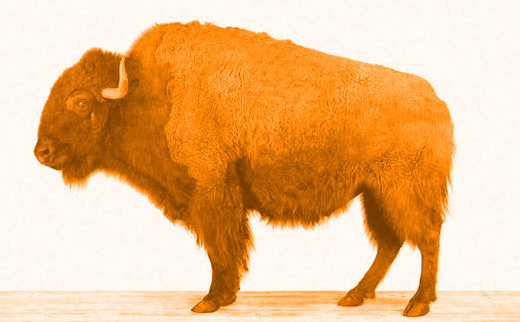 The Buffalo flavor comes from Buffalo New York. Like any legendary flavor, there is much speculation, rumor, and myth surrounding its inception. While I've never been to Buffalo, NY I am willing to bet that 90% of restaurants that serve hot wings claim to be the original home of the buffalo wing. While formulations vary, the "Buffalo" flavor has become a catchall for most standard hot wing sauces. I think the original buffalo sauce was made from Frank's RedHot sauce and butter. It is a wet sauce rather than a dry-rub. Jokes Aside, What Is A Chicken Fry? If you want to get philosophical like "what is a hotdog?" then I actually have no idea what a ChickenFry really is or why/how it exists. Other than that, it's a chicken nugget made from processed chicken meat and shaped into a long skinny fry shape rather than a nugget shape. This allows the chicken to dry out completely and be mostly breading with a rubbery chicken flavored filling. I think it's mainly a Burger King thing. (That would be a great bumper sticker!) But I'm getting ahead of myself. Pound Exclaim say: "a journey of fast food begins with the drive-thru." Wait, no. It begins in the head when the fast food marketing team creates a gimmick and plants the seeds of desire in my heart. The Drive-Thru: I didn't get this myself! I literally cannot begin to tell you about the drive-thru experience. This was gifted to me as a reward for lifting heavy things. So in this case, the journey begins with pulling the food out of the bag. 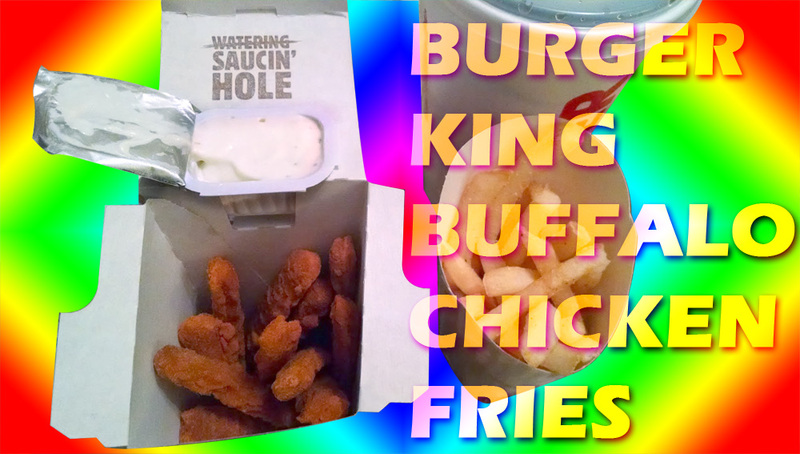 That's BK's promotional image for the Buffalo Chicken Fries. They're getting cheeky with the interpretation of "buffalo" (see the horns and bull ring?) and they're obviously trying to evoke emotional connections to the perennially popular Angry Birds franchise. As it is a promo pic, I want the reader to note that this image portrays the chicken fries at their best. The only photograph I took of this meal is in the lead pic. I don't endorse visiting other blogs to read about disgusting fast food, but in this case you might want to do a Microsoft Bing Image Decision. Oh wait, Bing is no longer referring to themselves as a Decision Engine? [extremely napoleon dynamite voice]: Gosh fine! I'll hotlink a pic myself! On a side note, these both seem like blogs I need to follow. I didn't count how many sticks you get in a box and I don't know the price. What an underwhelming review! It felt like infinite sticks though. Like it was Mary Poppins' purse except instead of fun nanny stuff it was ChickenFries and no matter how many you felt like you'd eaten--more than enough--there was always at least one more and you had to finish them all in order to be polite in front of your hosts and also to be thorough so you could write a review later. I think you need help. So there may have been 9 or twelve or 15. Probably a dozen. I think I can count 11 in my picture. Yeah, we'll say a dozen. And fries and a Coke. What do you call a three-dimensional shape with six sides, but only two of them are equal? Irregular polyhedron of some sort? Well, that's the shape of the box in which the ChickenFries are contained. It was a really fun decision on the part of the package design team. I'm constantly opening regular squares and rectangles and the contents seem super bland. But opening these ChickenFries was exciting! The lid pops up and there are two partial side flaps you have to fold back to fully unveil your bounty. And then--check this out--a section of the lid and rear wall are perforated in a fashion that you can fold out a little pocket that is exactly the correct size to hold a sauce packet! We've seen this before as it is becoming common in fast food packages whose contents would benefit from a sauce. The problem, though, (there is always a problem) is that the architecture of this particular vessel creates a top-heavy structure with a narrow base. This weight distribution imbalance becomes exacerbated as the ChickenFries are depleted and/or the sauce packet is replaced with a new, full sauce packet when the first one is extinguished. This is problematic to a structure holding an open sauce packet. Without special considerations by the user, this package architecture will likely result in the rapid deployment of Ranch Sauce upon your z-axis platform. I don't even know what I'm saying anymore. The more ChickenFries you eat, the more likely you are to get Ranch on your pants or table. Especially since the ratios are off. One sauce pack isn't enough for 12 ChickenFries. And while 12 ChickenFries can counterbalance the weight of a full sauce pack, 6 ChickenFries cannot (when u replace the empty pack). When I start a restaurant, my chicken nugs will come in a pyramid and the tip folds back to hold the sauce. Or no wait, there is a secret chamber within the pyramid that already has sauce in it. Look at the words by the sauce pocket. Burger King is being saucy ( <-- I know! ). It reads: WATERING SAUCIN' HOLE. I have so many questions about this. First of all "sauce hole" sounds so terrible and a saucing hole isn't any better. So what happened? Is BK being intentionally edgy/gross? Did some sassy designer slip one by the Project Leader? Are they oblivious to the ideas conjured by a saucin' hole? They probably felt like something had to go there. Design rule #1: no surface is blank. What a terrible rule, btw. Have you ever opened your chocolate and the wrapper has a message for you about how special you are, or that, like, you totally deserve to indulge in that naughty little treat? And/or not only did something have to go on that blank surface, but they thought that the consumer might be too dumb to know about their clever box design. I get that sauce pockets are new-ish and people might not know, but it's like writing "Open Here" on what is obviously one of two points to open a cereal box. I guess you should never over estimate your end user, though. Actually, I'm surprised it's not accompanied by an illustration depicting the proper technique to place one's sauce in the sauce pocket. Like, I get the feigned original draft "watering hole" because it seems like a Western USA tie-in with the whole buffalo theme they're forcing. Why drop the "g" in saucing? Was "Watering Hole" supposed to be the proper sign, representing The Establishment; and BK sauce is irreverent and edgy so when it took over the watering hole with anarchic aggression it wanted to let everyone know it was in charge but at the same time it was cool and one of the people? Like, is this ChickenFry container a microcosm of the American spirit of being a no-holds-barred sorry if I hurt your feeling's but imma tell it like it is good ol' boy tuff & rumble hardworking bud-lite-drinkin' kinda guy? "I don't follow the rules, but put your sauce in this hole because it's the hole where the sauce goes." I got yer saucin' hole right here, buddy. In taste and texture these are much like Burger King's regular dinosaur shaped chicken nuggets. They are dry and rubbery and contain very little chicken. 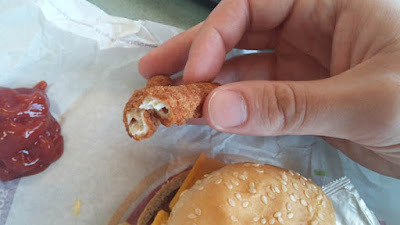 All of Burger King's chicken products are terrible. These BUFFALO ChickenFries were dry. Remember how we were talking about buffalo being a wet sauce? And remember how every time in your life you've ordered buffalo wings they've been in a wet sauce? 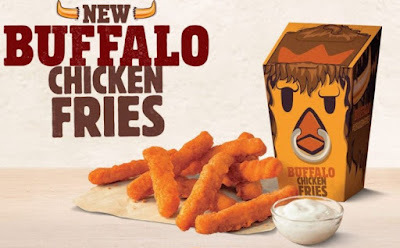 Burger King is using "buffalo" very loosely here. Maybe I was supposed to order a buffalo dipping sauce. I ordered a ranch dipping sauce because in nature ranch is buffalo's natural mate. Bleucheese can burn in hell, #Ranch4Life. Oh, I just re-watched the commercial. BuffChickFries are a "new way to buffalo" because the guy eating regular buffalo wings can't answer his phone when Dawson's Creek calls but BK's guy has dry fingers and sends Dawson to voicemail. Besides not having a wet sauce--yes, beyond that--these were dry in a way that Ranch lube is a necessity if you want to swallow your bite. Which, I'm only saying that because you might not want to. Swallow, that is. Because remember? Not yum. In one of my stolen images above you can see a bifurcated cross-section of a buffchixfry and I would note that the fry in question is a very healthy specimen. The inner chicken width of most of my bfchxfries were much less substantial. This isn't unsubstantiated slander, just take my word for it! Flavor: well, they weren't hot at all. Some buffalo wings can be pretty preetty spicy. These had the spice-level of a well-peppered baked potato. It was more "a hint of zing" or the "essence of spice" which I think came primarily from black pepper and onion powder. Those were the dominant notes. And garlic. The Ranch sauce enhanced the onion/garlic flavors and as mentioned previously, provided some much-needed moisture. "Did you feel poorly afterward?" Absolutely, you betcha! As a general note: my diet has been a wreck recently, you know...with all of the excuses going on and everything. So I didn't have a baseline to say to what extent this made me feel poorly. Let me paint a picture. You know how like if you cross the mafia in movies they will put your feet in a bucket of cement and then push you into a body of water? Okay, well in my metaphor the Burger King was the cement and my stomach was the guy and I was the body of water, err, wait, no I was the mafia. Umm. I think you get it. It felt heavy and bad inside of my body. Burger King Buffalo Chicken Fries are not a good thing to eat. They do not taste good and do not make you feel good. No comment on price/value. "Would you eat them again?" If I were to attend a fast food party and there was a platter of chicken fries I might put one on my tiny plate and take a bite as something to do with my hands as I walk around and mingle--kind of like a prop--then set it back down. Then later I set down the plate in the kitchen to go play Apples To Apples with everybody and forget about it or not remember which plate was mine. The french fries were okay.